My dear Lord, You sent Your divine emissary of compassion to us, Srila Prabhupada, who gave his life to give us life. As the Founder Acarya of the International Society for Krsna Consciousness, Srila Prabhupada declared this society to be his body. Bhakti Tirtha Swami offered his own life for the healing of our ISKCON which he saw was greatly weakened due to offenses against our women and children. On this most auspicious Appearance Day of Lord Nrsimhadeva, let us follow in his holy footsteps, offering our hearts at the feet of the Lord for purification and rectification for the cleansing, healing and upliftment of Srila Prabhupada’s body, the International Society for Krsna Consciousness. O Conchshell, your name is Pancajanya and you reside in Lord Nrsimhadeva’s hand to bless the devotees with all auspiciousness. You represent victory and protection for the devotees. You are blown three times. With the first blow you kill the demons; with the second blow you bless the devotees; and with the third blow you announce the victory of a pure heart. Please purify us and give us the strength to be determined in our battle against Maya. O Club, your name is Kaumodaki and you are very dear to Lord Nrsimhadeva who uses you for smashing the demons. O Lord Nsrimhadeva, the atheists of avidya and aparadhas have invaded the Nama Hattas in the city of our hearts and our beloved ISKCON. Please run through the streets of our hearts and of our ISKCON society and pound these demons to pieces with the thunderbolt strikes of Your club. O Shield, marked with a hundred brilliant, moonlike circles. Please cover the eyes of the sinful enemies of envy that make us blind to the good qualities in others and force us to offend the Vaisnavas. O Sudarsana Chakra, chief of the Lord’s emblems, symbol of power by which Lord Nrsimhadeva controls this whole cosmic manifestation. O invincible wheel of time, powerful as the sun and moon, impossible to check, You are the Lord’s final and ultimate weapon to kill the demons and protect the devotees. Our souls are covered by the darkness of greed, anger, pride and the desire for fame. O Sudarsana, full of transcendental effulgence, kindly shines in our hearts and within our ISKCON and destroy the darkness. You easily disperse the magical forces of the demons, root and chase away the demon of aparadha from our minds and hearts and from our ISKCON society. O Sword, your name is Vidyadhara please cut the roots of sin from our minds and from our beloved ISKCON and protect our tiny creepers of bhakti. 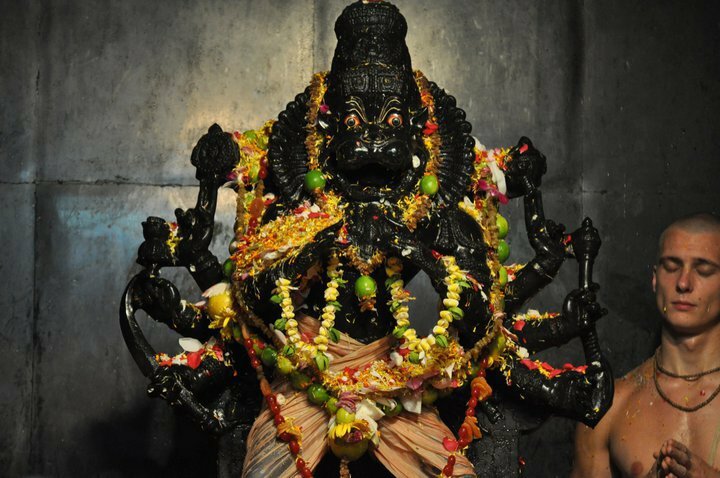 O Lord Nrsimhadeva, there are many hidden demons lurking in our hearts and the heart of our society, please find them and destroy them with Your powerful hands. O Lotus flower, You are the symbol of the Lord’s blessings. As bees live inside the lotus, may the bee of our minds always be sheltered within You. My dear Lord Nrsimhadeva please pick us up as You did Prahlada that we may become free of all fear and lamentation, full of love for Srila Prabhupada and Sri Sri Radha Syamasundara. May we become pure in heart and mind and empowered instruments of Your compassion and mercy in this world, engaging in sweet ways to please all Your devotees. By your grace Srila Prabhupada and the mercy of Lord Gauranga, Sri Nityananda Rama and the whole Pance Tattva, may we become again strong and united, an empowered force which can turn back the tide of Kali for the benefit of all conditioned souls.